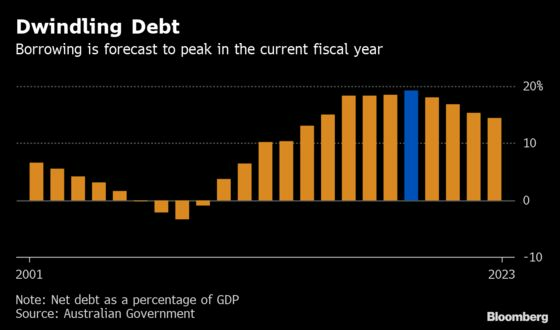 (Bloomberg) -- Prime Minister Scott Morrison’s government pledged sweeping tax cuts and forecast Australia’s first surplus in more than a decade in a budget aimed at engineering a come-from-behind election victory. 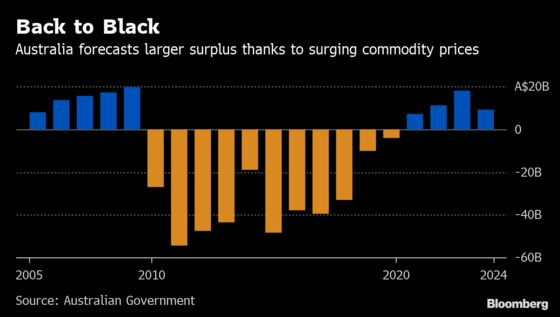 The Treasury projected a A$7.1 billion ($5 billion) surplus for the fiscal year through 2020, or A$3 billion more than a December estimate, thanks to surging commodity prices and a hiring bonanza. 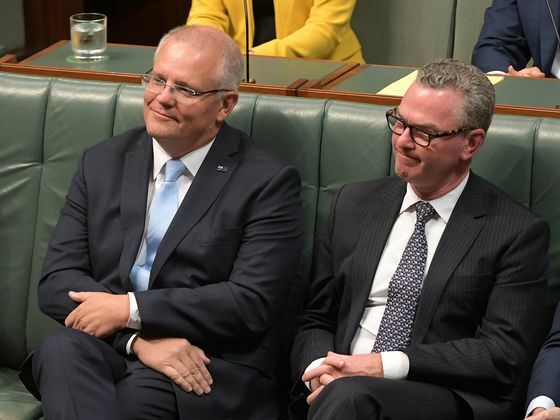 That’s handed Morrison ample ammunition to promise tax relief to about 10 million voters ahead of an expected May election. “The budget is back in black and Australia is back on track,” Treasurer Josh Frydenberg told parliament as he handed down the annual budget in Canberra on Tuesday evening. The triumphant tone may prove short-lived with opinion polls showing voters are set to oust the Liberal-National coalition, handing the main opposition Labor party power and an economy that’s starting to falter. Earlier Tuesday, the central bank kept interest rates on hold and noted weakness in consumption due to stagnant incomes and falling home prices. While the government forecasts surpluses through at least 2023, it relies on some rosy economic projections. Stagnant wage growth is predicted to leap more than a percentage point after hardly budging for the past five years. The government’s also banking on continued solid jobs growth and consumption holding up. Much of that optimism jars with recent developments. Australia’s economic growth has sharply slowed, with household spending looking fragile amid the worst property slump in a generation. That’s alongside a slowing global economy and ongoing trade disputes between the U.S. and China. “Growth in household consumption is being affected by the protracted period of weakness in real household disposable income and the adjustment in housing markets,” Reserve Bank Governor Philip Lowe said hours before the budget’s release, when he held the cash rate at a record-low 1.5 percent. Still, commodities earnings remain a boon for the government. Australian Bureau of Statistics data Wednesday showed the country’s trade surplus hitting a record A$4.8 billion in February. Retail sales also offered some optimism by climbing 0.8 percent in the month, the strongest growth in more than a year. Morrison’s budget, his first since winning the leadership in August after three years as treasurer, is aimed squarely at voters’ hip pockets. The estimated A$158 billion in promised tax cuts over a decade comes on top of A$144 billion of relief that was passed last year. The government won’t seek to legislate the tax cuts in coming days -- the final sitting week of parliament before elections are expected to be called. Returning to the black is important for the Liberal-National coalition as it reinforces its reputation for sound economic management. The coalition regularly recorded surpluses under former Prime Minister John Howard, before the budget fell into persistent deficits under Labor following the global financial crisis. Running a surplus is particularly important for Australia internationally, as it consistently operates a current-account deficit. The government also promised to eliminate net debt by 2030, which is expected to peak at 19.2 percent of gross domestic product in the current fiscal year. “Only one side of politics can do this, because only one side of politics has done this,” Frydenberg said. With polls pointing to a comfortable election victory for Labor, attention is already focusing on the alternative budget to be delivered by opposition leader Bill Shorten on Thursday night. Shorten said Wednesday Frydenberg’s fiscal blueprint was a marketing exercise, not a real budget. He sought to neutralize the potential poll bounce that the tax cuts could deliver the coalition, saying Labor would support the relief for low- and middle-income earners.